The Auto Expo 2018 had an underlying theme of technology, with almost every car maker showing off their advancements in the field of automotive technology. Here's looking at some that really caught the eye. The 14th Auto Expo 2018 has lived up to its billing as the most technology-heavy car show in India till date. Exhibitors from across the world spoke in unison about the rising importance of technology in the field of cars, and brought a bunch of interesting exhibits and concepts that serve as the proof of what companies across the world are pitching as the future of mobility and transportation. These concepts and prototypes include fuel cell vehicles, three-wheeler smart mobility concepts, high level autonomy in cars and even autonomous, self-balancing motorbikes. If you couldn't make it to the Auto Expo 2018, we bring you the best of automotive technologies that were on show from the inaugural day of Auto Expo 2018. 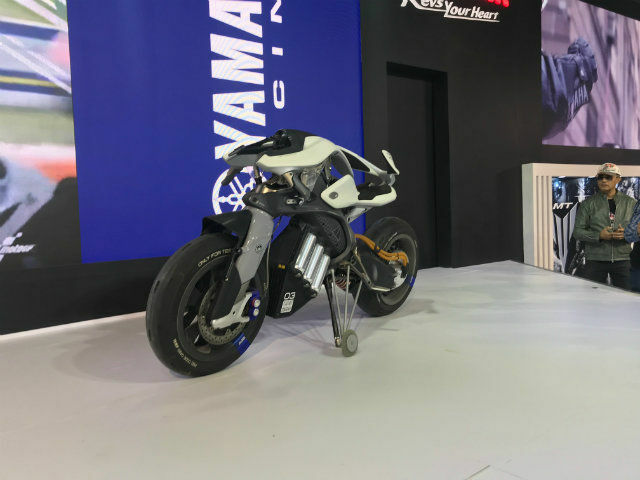 Perhaps the most impressive, and one that was not expected to steal the headlines was the Yamaha Motoroid. This motorbike can recognise gestures and faces, unlock and balance itself, and go around by itself, without any kind of human intervention. The motorbike can learn frequently travelled roads to improve riding quality, and even has an HUD projector to project information like speed, navigation, battery status and connectivity in thin air. The Motoroid is, needless to say, a concept till now, but is a marvellous sneak peek at what motorbikes can expect in future. It is also, of course, fully electric, and hence meets the emission standards expected of cars and bikes of the future. 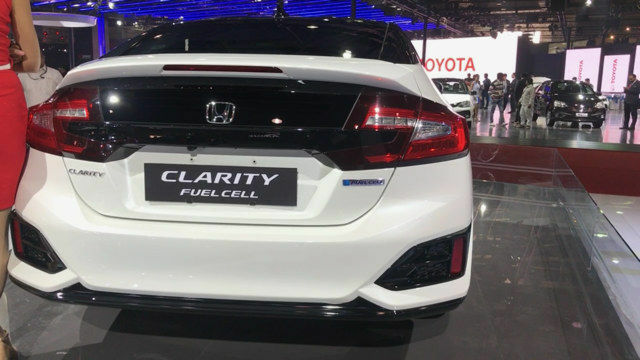 While fuel cell cars are still far from being a majority, the Auto Expo 2018 saw at least two concepts presented on its show floor - the Toyota FCV Plus and the Honda Clarity Fuel Cell. With the Indian government pushing for electrified mobility, the frequency of alternate fuel vehicles are bound to increase in the country. Mercedes-Benz has previously shown its GLC Fuel Cell SUV option globally, while Tata Motors also has a Starbus Fuel Cell prototype ready for production, which it unveiled back in 2016. These new entrants are not being strictly unveiled in India per se, but both Toyota and Honda brought it to the Auto Expo 2018 as a show of what it is capable of doing with alternate fuel cars. The Toyota FCV Plus is a four-wheeler concept that may be used for commercial mobility in the ride sharing space. It is also built for autonomous driving, and the interiors are designed to be converted to a living room space if needed. The Honda Clarity Fuel Cell, meanwhile, is a more conventional luxury sedan with quirky design elements, but nothing about it really gives away its alternate fuel powertrain. The Clarity resembles and falls in the Accord Hybrid's category in many ways, and may come to India as an upmarket passenger vehicle once the EV market starts picking up pace in the country. 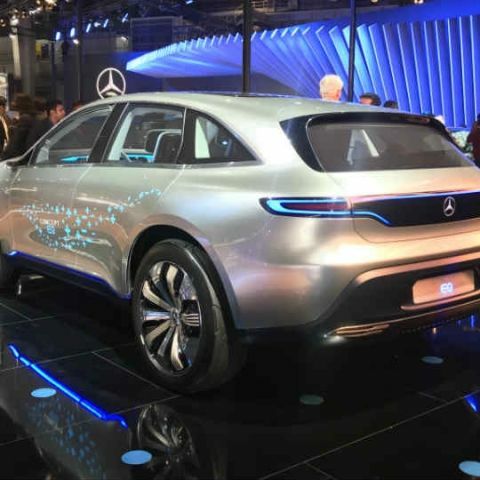 The Mercedes-Benz Concept EQ was one of the most impressive and intelligent cars to be present at the Expo, although it was strictly present as just an exhibit. The Concept EQ is a vision of Mercedes-Benz's future mobility plans, coming with Level 5 autonomy, almost every driver assist mechanism thrown in, fully electric powertrain with high density batteries, and a futuristic cockpit with augmented reality displays mounted on the windows and windshield, a retractable steering wheel and swivelling seats that enhance productivity, lifestyle and multitasking. 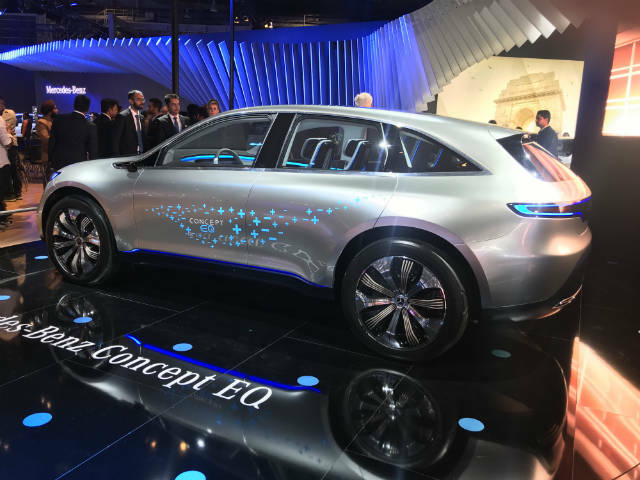 The Concept EQ's presence in India is a sign of intent from Mercedes' part, and will be the platform based on which a number of the company's future cars will be built. Incidentally, India is slowly picking up pace as an important growing market for Mercedes-Benz, and the company continues to hold fort with the highest market share among luxury car makers along with an impressive growth rate. Hopefully, the Concept EQ would feature in India soon enough, as we build our way towards autonomy. 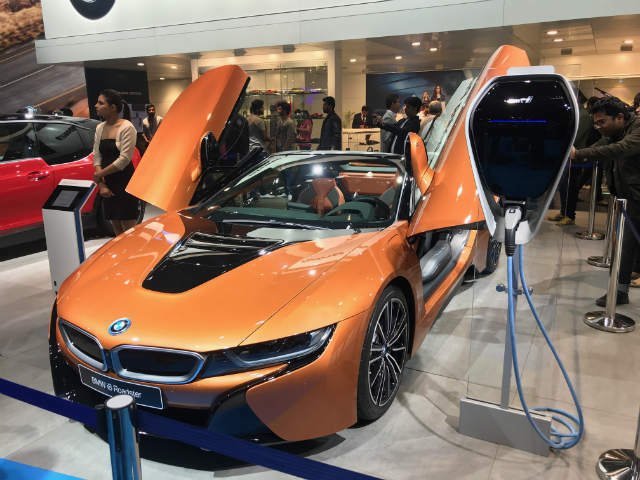 The BMW zone at Auto Expo 2018 was strewn with the likes of the X6 M Sport, M3 and M5 performance sedans and even the venomous M4 coupe, but the one zone that definitely attracted a lot of eyeballs was BMW's i arena, presenting both the i8 Roadster, and the i3s family hatch. BMW's i division stands for electric mobility without compromising on performance, which we saw clearly in our drive of the BMW i8. Now, the company is set to bring the Roadster edition of the i8 to the country, along with the i3s. The two cars come with plug-in hybrid and electric powertrains, although the iDrive infotainment system powering these have now started showing its age in face of swanky, cutting-edge in-cabin tech from other car makers. Nevertheless, the BMW i3s is set to debut in India this year, although there remains much debate about its pricing. Any guesses? The Honda Sports EV was one of the pleasant surprises in store for motoring enthusiasts at the Auto Expo 2018. Seeing the Sports EV in person in India is a rare feat indeed - after all, it is only a concept design built to Honda's tunes of fusing retro styling, its going-back-to-roots approach towards embracing new technology. 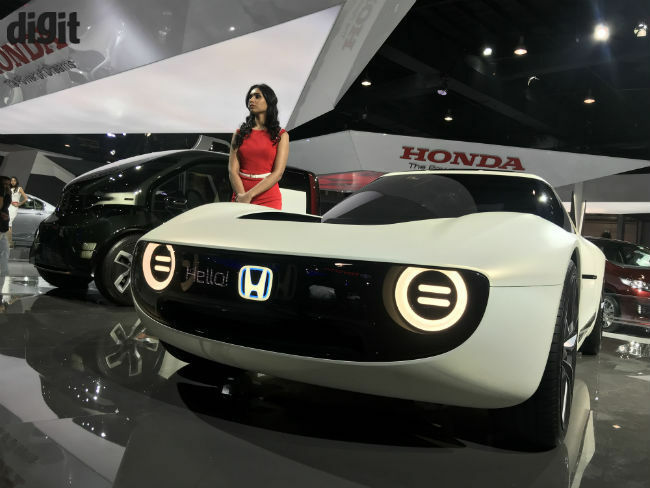 The design of the Sports EV is based on one of Honda's first four-wheeler cars made back in the 1960s - the Honda S600, which back then competed with the likes of MG Motors and Triumph on the race tracks. The Sports EV is a part of the Civic-based Urban EV that was also unveiled last year, and comes with a massive OLED touchscreen with gesture-supported UI for autonomy and infotainment. It also gets an all-electric powertrain, a bunch of retro-styled circular LED lights and LED message panels on both the front and back, which can greet people around, recognise its owner, or just simply smile. The NeuV in comparison is not as adorable as the Sports EV, but it too represents an important chunk of the future of mobility. The Honda NeuV is a shout out at shared mobility and its rising prospect, alongside autonomy and clean energy driving. Mahindra, meanwhile, is going all-out with last-mile electric mobility. Two of Mahindra's exhibits in particular - the Udo and the Atom, catch the eye for their smart city and electrification-oriented approach. 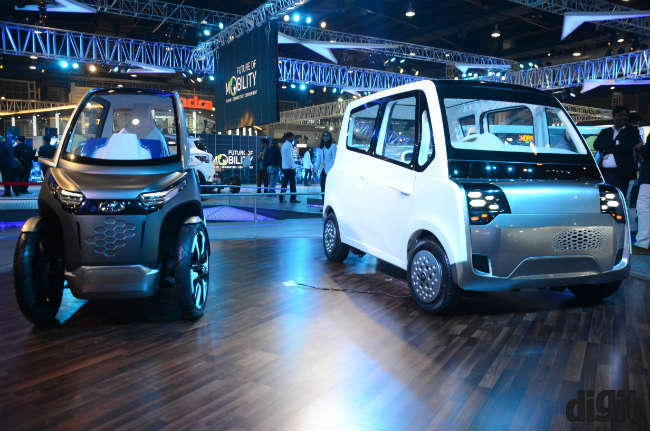 The Mahindra Udo is a narrow two-seater which is built to take only half of one lane to travel, and thereby aids last-mile connectivity in India as single-booking taxis. For four-seater vehicles that can potentially replace auto-rickshaws and provide the convenience of air conditioning and connected infotainment systems, is the Mahindra Atom - which can seamlessly accept bookings, and automate the entire last mile mobility procedure. Mahindra does seem to have taken a leaf out of Toyota's book, as the Udo and the Atom somewhat resemble the Toyota Concept-i Ride and Walk, although they differ in their approach towards the mobility front. Apart from the Toyota FCV Plus, the company also presented the i-Road and Ha:Mo concepts for localised mobility, which are aimed at streamlining mobility options for short range travels. These once again put the focus on using autonomous driving technology to aid disabilities, while refining the powertrains to be cost-effective, easy to recharge and seamless to own and travel in. Toyota's major efforts in streamlining mobility are so far confined to Japan, although we will hopefully see it bring more of its technologies to India some time soon.